Yes it is quite large Depends which store you buy from, they all sell larger thermal compound and have done for years. Again in the UK, it works out cheaper to buy 20g (£20) than 4g (£9). Keep the tube below room temperature and lay it flat, this will last the stated 8 years. Not sure if the compound has been improved but can remember keeping the old 4g MX4 for 2 years then disposing of it. As if this needs to be stated at all, Arctic MX4 is brilliant for non-conductive TIM! Yesterday I received this distilled water for cleaning rads, blocks, fittings/adaptors, tubing. 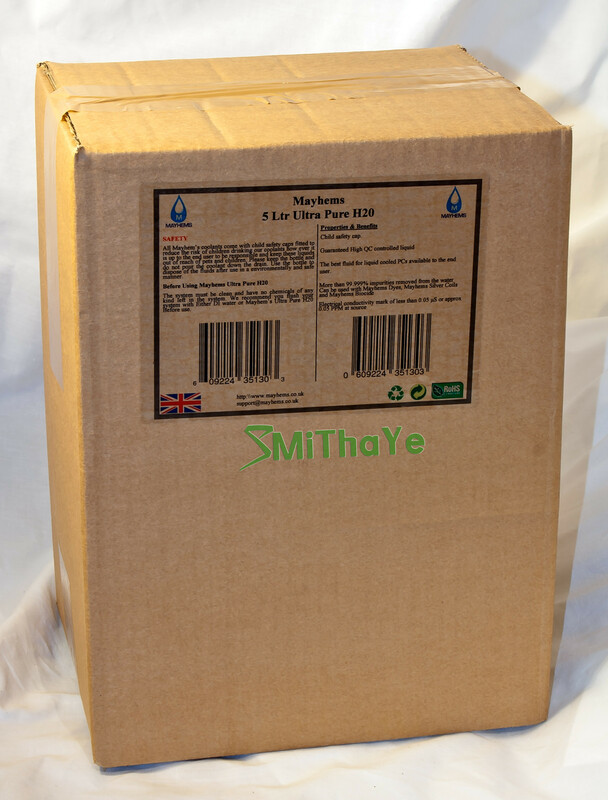 Mayhems are well known for their quality watercooling solutions with the very highest standards. These larger containers were reasonably priced for my needs. When I placed the box on the sheet there was a lot of dirt from the box as pictured, the two cardboard boxes were inside a larger cardboard box and were well protected but still there shouldn't any dirt and now this huge sheet requires a wash.
Wow thats true a 20g tube of thermal compound is the biggest i've ever seen also, it's sure going to be an awesome rig when you're done. 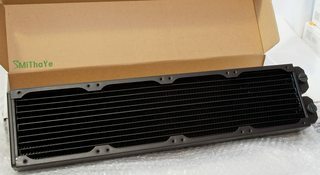 Update: My two 480 XT rads and R4BE blocks look odds on for being delivered today looking at the tracking info. 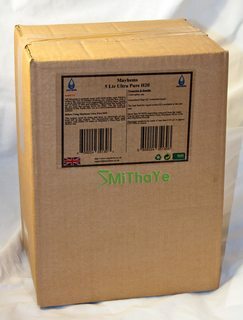 They were dispatched on Monday and they should come today going by EKWBs estimate of 3~4 days delivery. I think it came from Germany by ship, took a day to arrive in UK. As I've mentioned in the shoutbox, I've been busy with flushing and fitting the blocks to the B4BE and deciding what I need next. Anyway, some more photos. 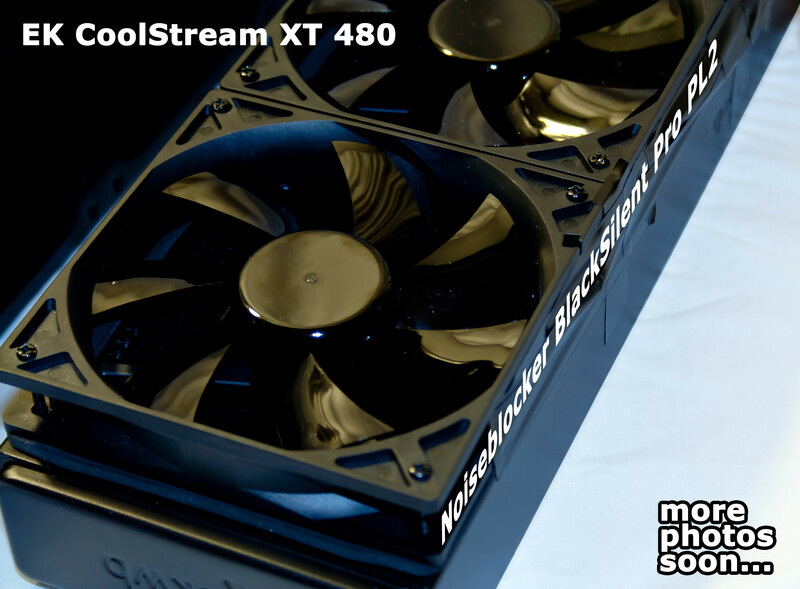 (16th January 2014) Two EK CoolStream XT 480mm rads and EK-FB Kit for the R4BE. 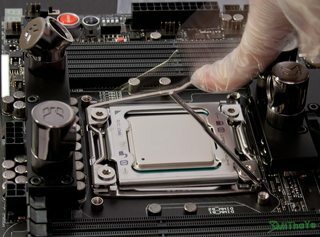 If it needs to be said to those who aren't familiar with watercooling, be careful and don't touch the fins because they are very delicate. First impressions are that this is very good quality, light and a reasonable thickness. I did initially want the 480 XTX and decided against it to allow better management of the tubing routes and clearance for the fans. Ideally I would have wanted the top fans on the outside of the top of the case with a shroud over the top to solve this, would have meant drilling a couple holes in the case to allow the fan wires a route back in to the fan controller. 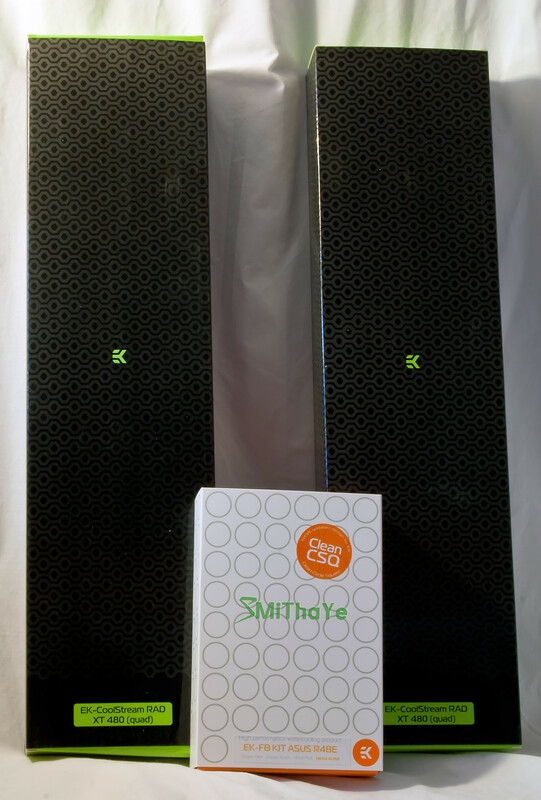 The case is tall enough as it is and the two 480 XT's is very capable of managing a 4930K and a 780 Ti Classified. 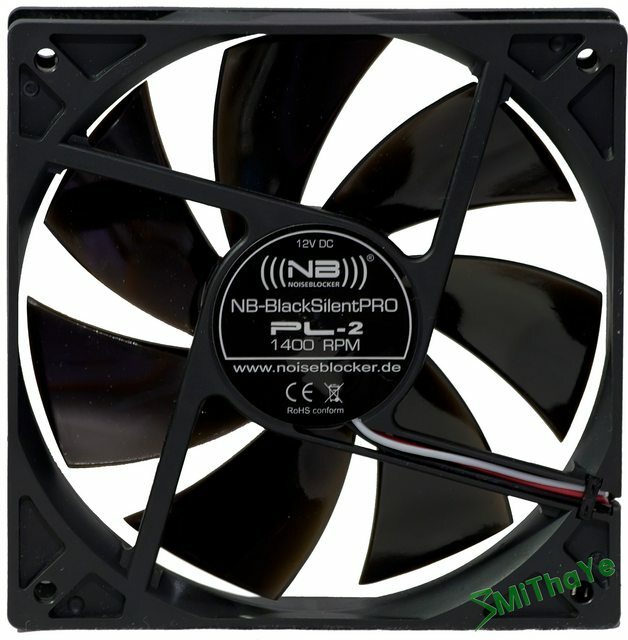 I will need more screws for to allow for 8 fans per rad and because the fans were on backorder I couldn't double-check which size M3 screws I'd needed. 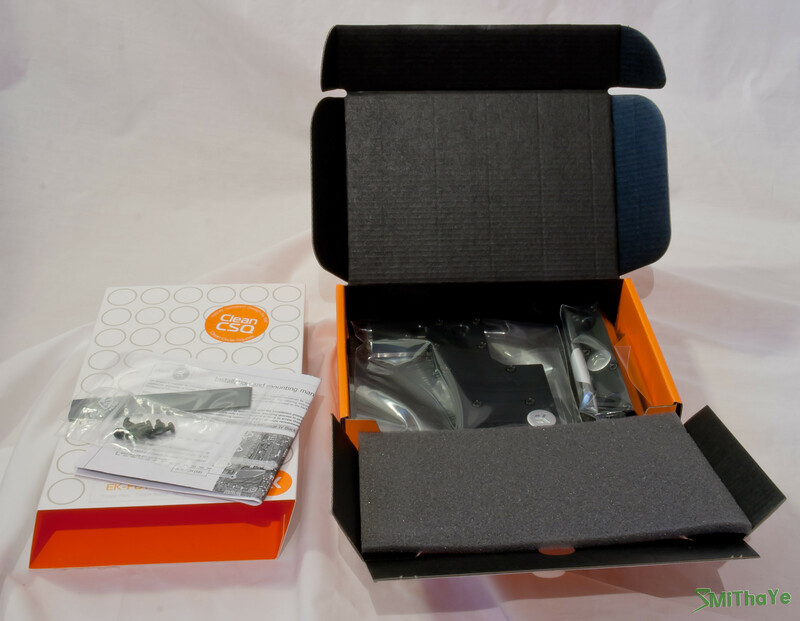 (21 January 2014) The block for the R4BE is nicely packaged and protected and the block itself is reassuringly weighty, this is the more expensive Acetal and Nickel version which some stores have yet to get their hands on and use the XSPC instead. Fair enough but I much prefer this version. 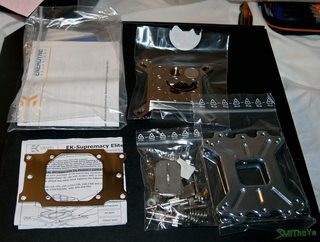 Before I dump all my distilled water in the rads, I spent some time on the EK-FB Kit. When I clean or flush with distilled water I'm using a stainless steel induction pan I bought just for heating it up to 45c (it will keep rising another 7c but levels off) and because of safety it won't be used for anything else. 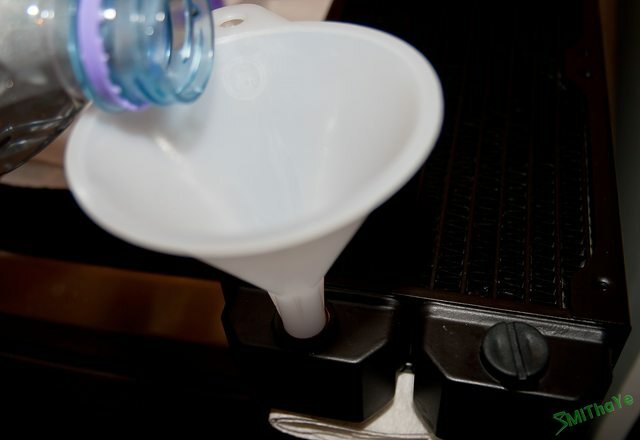 I'm using a plastic funnel that fits right into any 1/4 slot and slowly pouring the distilled water in over a thoroughly cleaned white dish so I can see any crap that eventually comes out. I will never get sick of looking at this board, feature rich, well constructed, and its black But the standard cooling options have to come off via the screws on the back of the board, instructions are very clear how to best approach this. 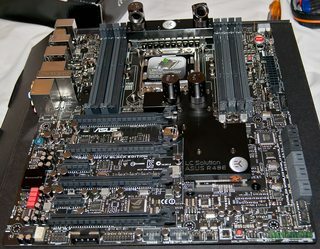 The stock cooling is removed from the chipset opposite the PCIe lanes, and Vregs at the top of the CPU. 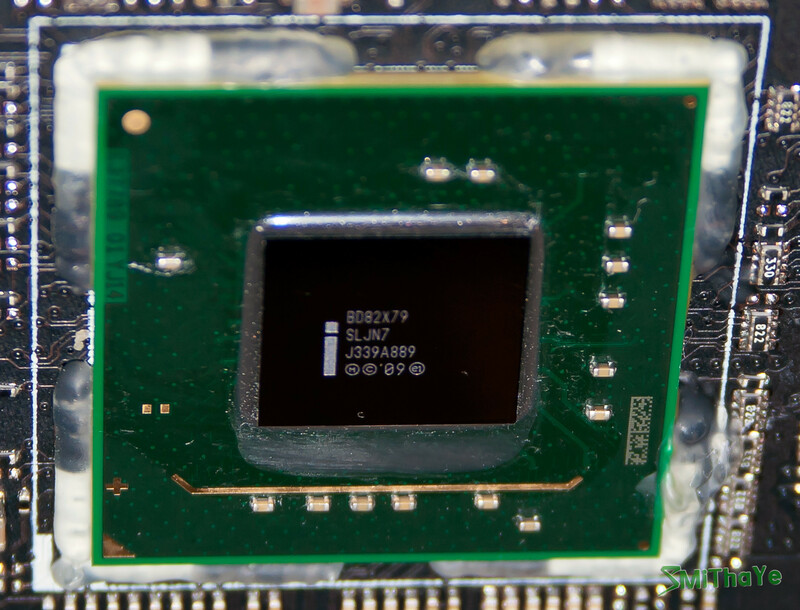 Main downside with removing them is that the I/O shroud now reveals the standard silver look of other boards, if you check the top of the image you can see there's about a 1mm heatpipe that connects it. Unless someone is braver than me in hacking it up to attached it or a separate one arrives, I will leave it alone. 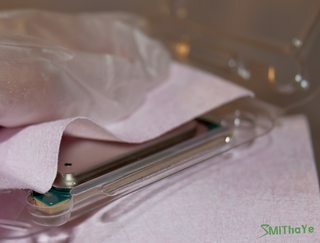 Don't worry about the bits of MX4 I got around the chipset, I cleaned that off Now I got my trusty little bottles of Arctic TIM remover out and got to work quickly cleaning up the thermal pad remaining on the chipset, I then cleaned up with surface purifier and a microfibre cloth. 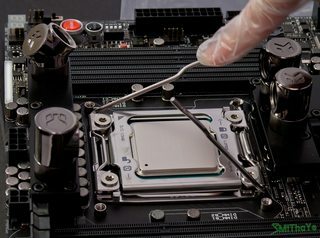 Throughout this build I always use disposable gloves to avoid leaving oil, fingerprints etc from my hands on any surface which can cause components to fail, I find that no matter how well you wash your hands you simply can't beat popping on gloves. The Vregs were difficult to apply the MX4 (HAS to be non-conductive which it is) and had to use buds to apply it. Then you cut the thermal pads to shape, take off the sticky foil and apply to vregs. The thicker of the pads you apply to the inductors (left), and the thinner pads you place on the mosfet chips (right). Annoyingly once everything is screwed in, the instructions tell you to take the blocks off and to check the imprint, same with the larger chipset and those screws aren't easy to work with. They were placed on perfectly anyway and I know its best to check than risk shorting your expensive board! 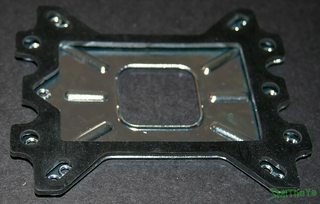 Now moving on to the CPU block with the excellent EK Supremacy Elite Edition for the LGA 2011 platform. 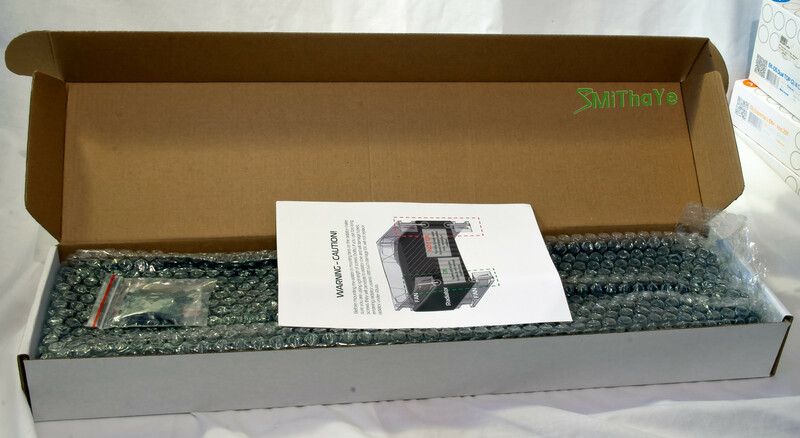 Instructions aren't too clever and assumes this is a standard CPU for the likes of 1155/1156 with the steps on jet plate removal and backplate that don't apply - I still included those photos for others here. 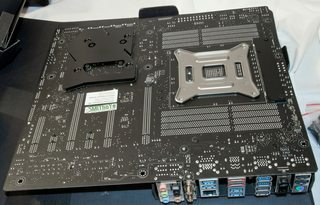 This delayed me quite a bit, went along with it trying a few things out including removing the backplate with my own allen key but there was no way the plate provided would fit and would only end up shorten the board so put the existing one back on. 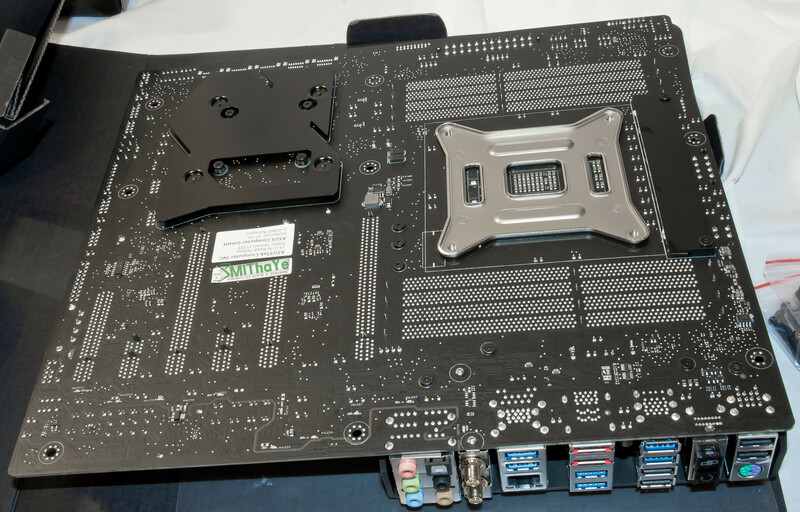 That was the only issue I came across otherwise its like fitting any heatsink. 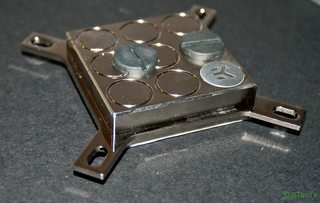 On the 2011 platform the M4 screws fits inside the ILM (integrated latch mechanism) and the block effortlessly slides down it. 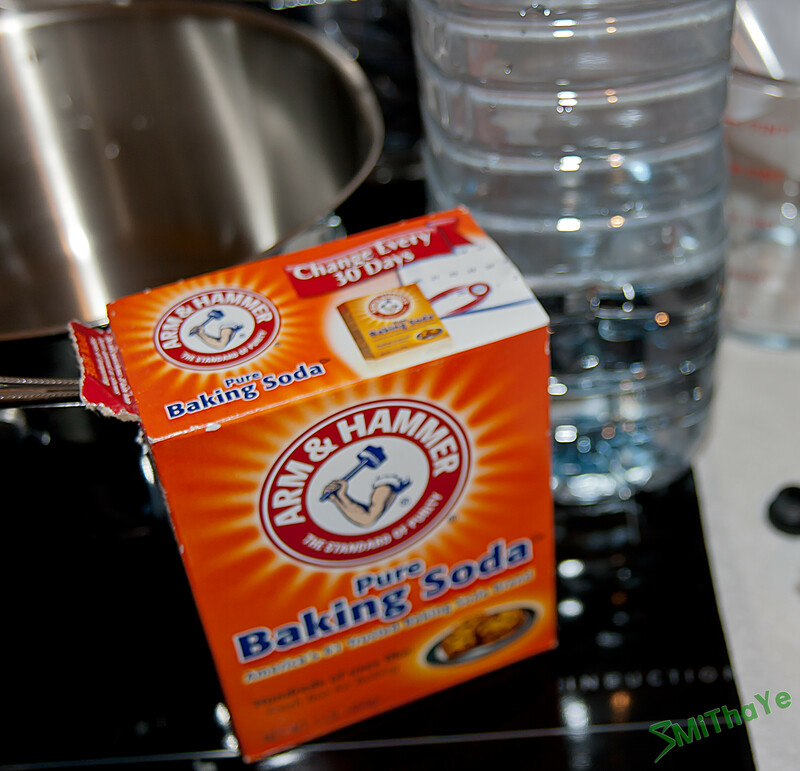 I'd advise again its best practise to rinse this block with distilled water and also clean as if you were reusing it. Entire contents of the box (oops forgot to take photo of box) and most of what you see here we don't need, just need 4 M4 screws, 4 springs, 4 thumb nuts and the weighty block itself for my 4930K that I had difficulty sourcing stock of. Used the rad caps for giving the block a good shake with warm~hot distilled water. 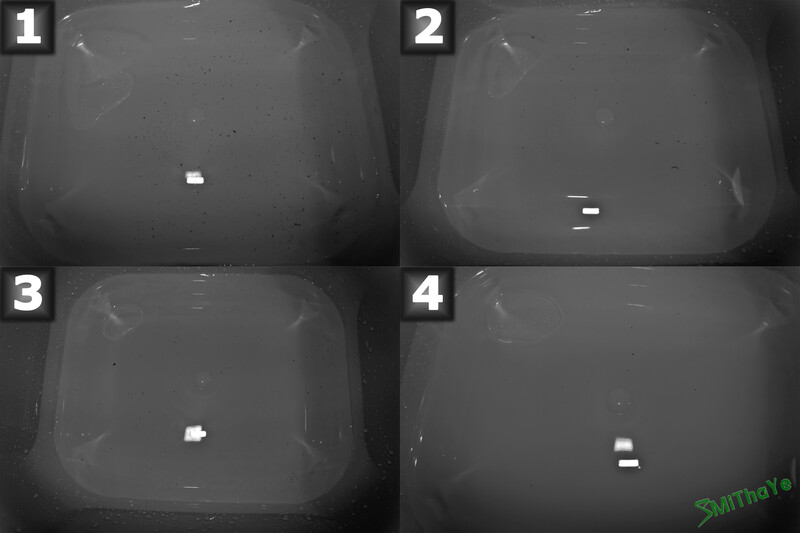 The marks you see on these detailed photos are machine marks and dust, I was in the middle of cleaning! As I already stated, the last photo above is simply showing the removal of the backplate for other platforms. 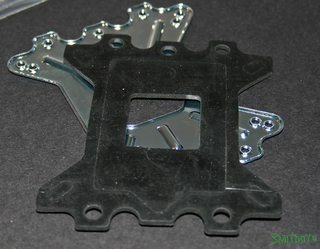 Backplate rubber gasket: This was very dusty and because I thought at the time I may need it, I cleaned it with hot distilled water. More wasted time If you did use it was use on the 1155/1156 or 1366 platform and you are required to remove the inner rubber, says to use it for 2011 too but that's not the case here for sure. Noticed these four rings when I was cleaning, haven't come across this before!? 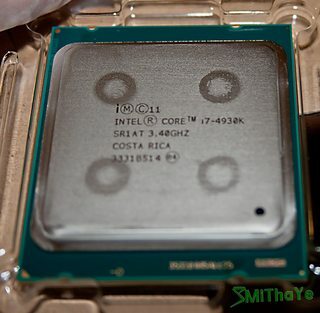 I'm nearly back to Extreme CPUs since my QX6700 days but without wasting good money needlessly and hope Intel keep to allowing us to play with clocks. 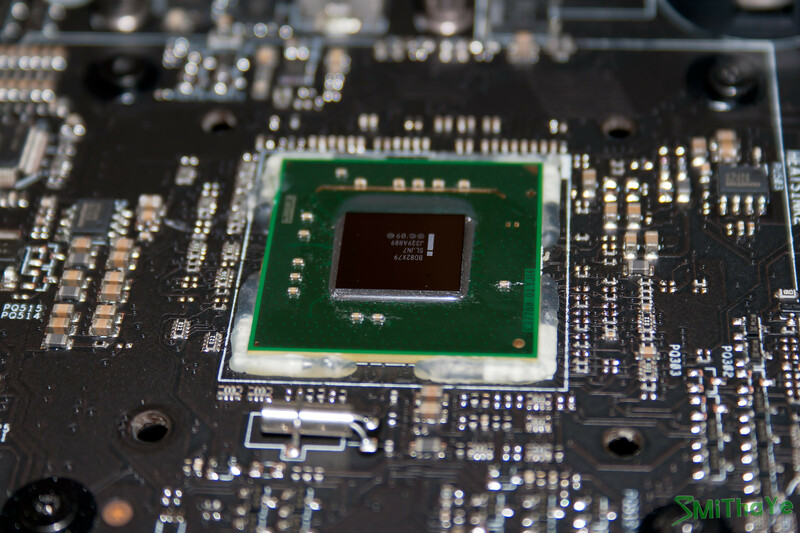 Another reason for 4930K apart being hex core for rendering is no worries about the temperatures and delidding unlike Ivy Bridge and Haswell. 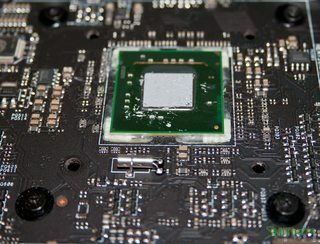 My 2600K is soldered but my 3570K isn't, I can see why people took extreme measures removing the poor quality TIM and applying their own. Got a good discount on 4930K which meant I could get exactly what I needed on other things. 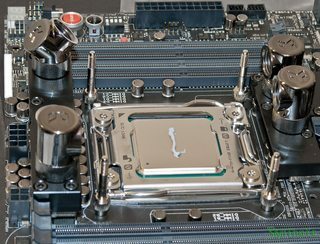 The wait on a lot of items was frustrating but worth being patient for, Guinness coined the phrase very well: "Good things come to those who wait"
Now the cleaning is done it's time to install the CPU and the block Double-latch even though its a shrinked 257 mm2 die with better IMC, no lasered off cores here to annoy us that it's really a Xeon. 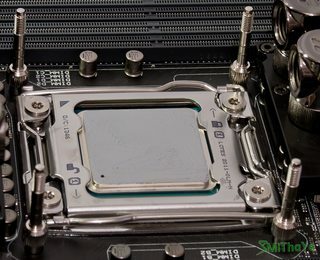 Why is the CPU orientation wrong, ie upsidedown? 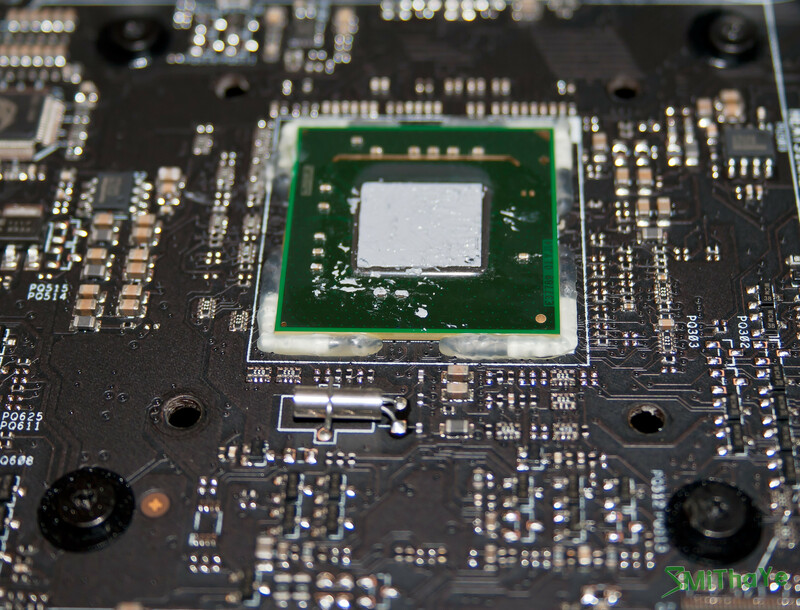 Moving,on, a line of MX4 and I prefer to use cling film to smear it to the edge then use the excess on the film to smear on the central CPU block to allow a good bond. Note that I'm not using too much, just enough. When screwing the block you should tighten only two at a time to get it on evenly, think of the nuts on a car tire but swap after 4 turns to start the next one and stop when it won't tighten anymore and you're done! Since I don't have enough fittings or know which direction I will end up picking I've stuck on one bit of tubing so you get the idea. The southbridge block to the right is lower and I know now that I'd need extenders to bring it up about 25mm. Ideally I'd want to use longer extenders for this area entirely but the length is limited and quality of fittings not great from other manufacturers. 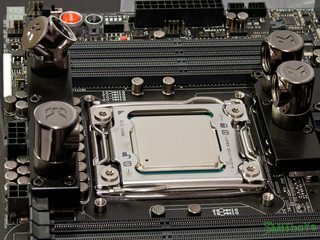 I will have no choice but to use extensions for the southbridge because it's so short from the CPU outlet and any angle kinks the tube. 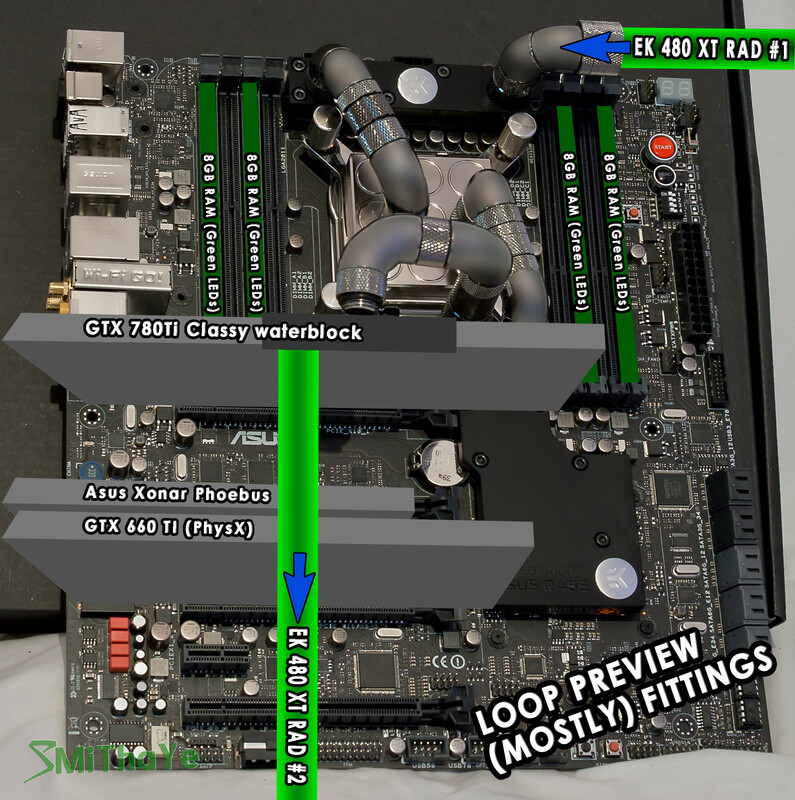 I have two choices there, either go direct into the left CPU or find alternative fittings for the current layout. 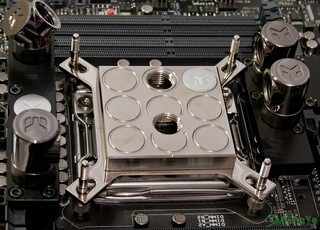 My choice of fittings is black nickel as you've seen but to open more choices I'd have to go for standard nickel, upside is that it will match the CPU block top. So what's next? Flush the two rads, verify the existing screw length and order lots more. 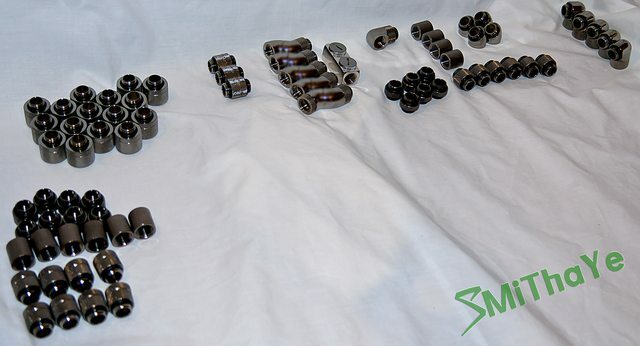 Give up on black nickel fittings and go with nickel and lots of extensions, probably spend at least £200 there. I know I've yet to block the GTX 780 Ti Classified but that can wait. Nice ! very nice ! , FInally some photos . How was your rad flushing ? and what the step you choose to flush the rads ?. Keep up posted . 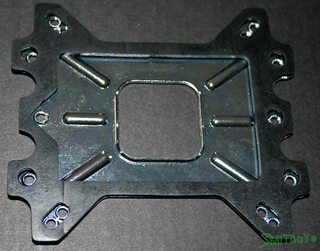 BTW the Backplate rubber gasket , did you purchase it seperately or something ? Haven't done the rads yet, been busy reading on other builds for ideas about the fittings and where I can get the fittings from. Plan on starting the rad today but not sure I will be too tired later cos I'm late going to bed lol. Steps to doing rad will be the same as most of this build, use 50c distilled water, fill and put cap on, leave for at least 30 minutes and ideally an hour then shake for a while then empty. Keep repeating until nothing but clean water comes out. Haha you finally move to bitspower, hope that your wallet will handle this , those fittings are the expensivest i ever saw , but the build quality is simply amazing . Personally i would go with the matte black just to match the case . Yip, Bitspower are expensive when talking about say up to 50 pieces but very good quality and finish. If I went for black it would close the door on extensions which are normally silver. 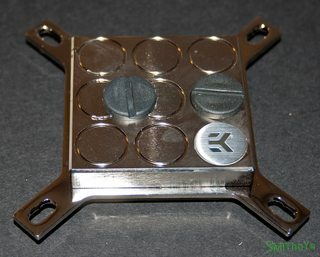 The CPU block is silver, I/O is silver so fits in with other aspects of the design. Not overly obsessed with the colour of the fittings, key is the better the choice of options to allow a short/neater loop. There are heaps of other builds with tubing all over and that's too lazy and not good enough for me or the components I'm using. If I end up with black nickel again that's fine so long as my other options aren't neglected. I had a look at the NB fans today and have to praise the accessories and not needing to use the cheap XSPC rad gaskets I bought separately - of course the gloss black fans look great too. 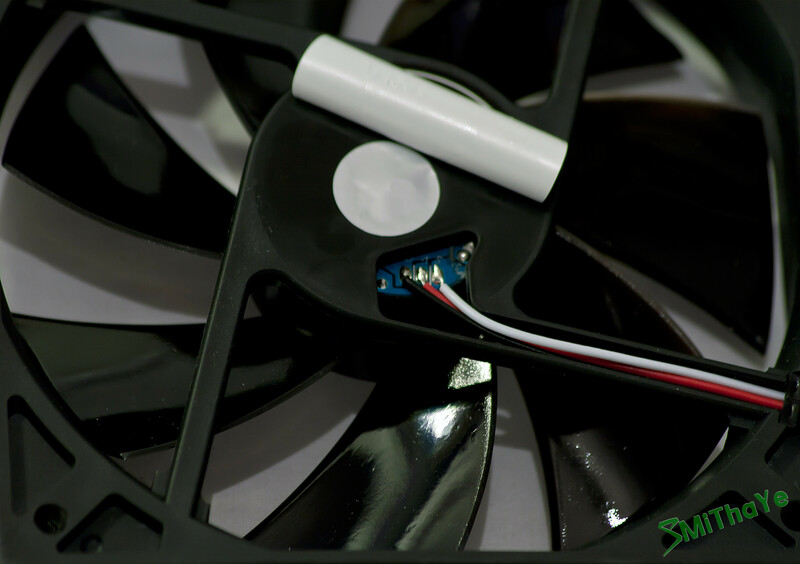 I can use the individual fan gaskets as provided to give better static pressure and reduce vibrations. The fans also come with longer M3 screws, looks like 35mm, and because I will use the rubber gaskets as provided and the screws with rubber washers, metal washers - the screw fits into the rad mounts without coming too close that it may puncture the pipes. Downside is that I'd have to do this 64 times!! Will cover this tomorrow. Right then, from the dozen fittings and extensions I ordered I solved the single issue with the CPU outlet to the southbridge block and I like the overall clean look of them. 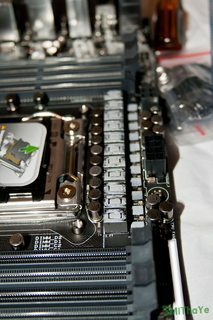 From now on it's Bitspower and all fittings, adaptors and extensions for the CPU area because of the short distance. My next order of fittings should be with me next week along with the EK-Dual D5 X-Res Link CSQ - that's the top for the pump to link the res. Some other parts are delayed like the mini valve to drain to loop from the bottom rad as that's the lowest point. 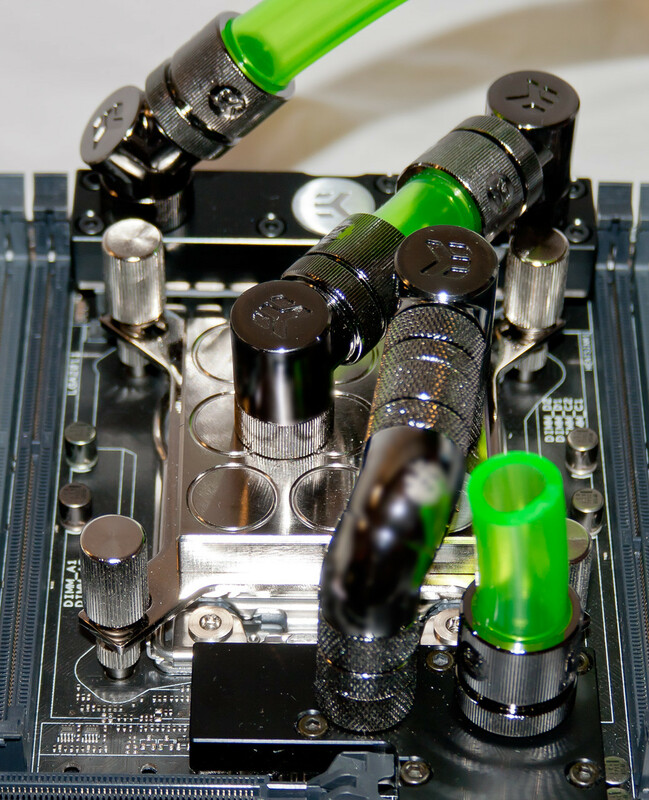 To and from that area is back to green UV tubing. I may come across small hiccups along the way because my thoughts have been elsewhere but for now this looks good. This is costing me a small fortune but if all goes to plan *cross fingers* it should look amazing! 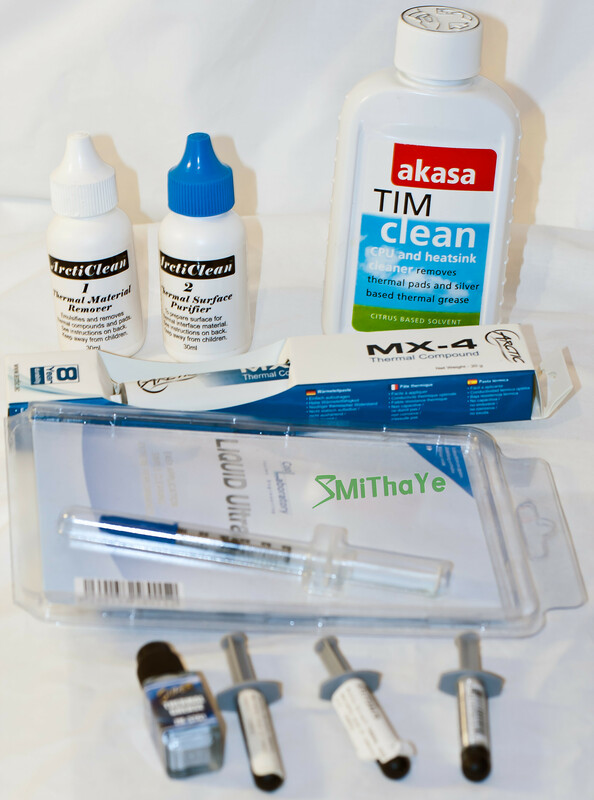 Also expecting Arm + Hammer pure bicarb for flushing next week too - kinda sick of the delays of waiting for stock coming in but now its yeah whatever, chase up if there is no due date though! Once flushing is done next week and fittings are completed it should be cased up quickly from then on going into the week after. Remember all the fittings I use are true high flow, there will be tidy tubing and not too much of it on show than what is needed, cable management as you know is always very clean but still a challenge on this build. Not really much thought about the pump+res but have a general idea. One issue you lot will notice much later on is the fact the GTX 660 Ti PE isn't blocked at all but for a PhysX only GPU I can live with not spending another £70 on it. Don't ever let nickel come near any amount of water. Sounds obvious and I knew this! The warm distilled water I used to dip the hose into (so I could easily fit over the compression fittings) had made the black nickel on them come off in places and now it looks very worn. I never planned on keeping the EK fittings in my loop and glad I noticed this early on how much a little water has an effect. Now I will use plain old force to get them on and its actually not that hard at all. Another tip, it's handy if your fittings twist when using so many extensions like mine otherwise I don't see how its possible to fit them once attached, double rotaries or triple have been great too but expensive and necessary. I'll probably be left with around 12 pieces I won't use but when you talking fractions from a fitting coming together with a socket its hard to say for sure what will work. Did think about using quick disconnects but that would spoil the look and you're talking about £16 each easily, you need male+female for it to work. 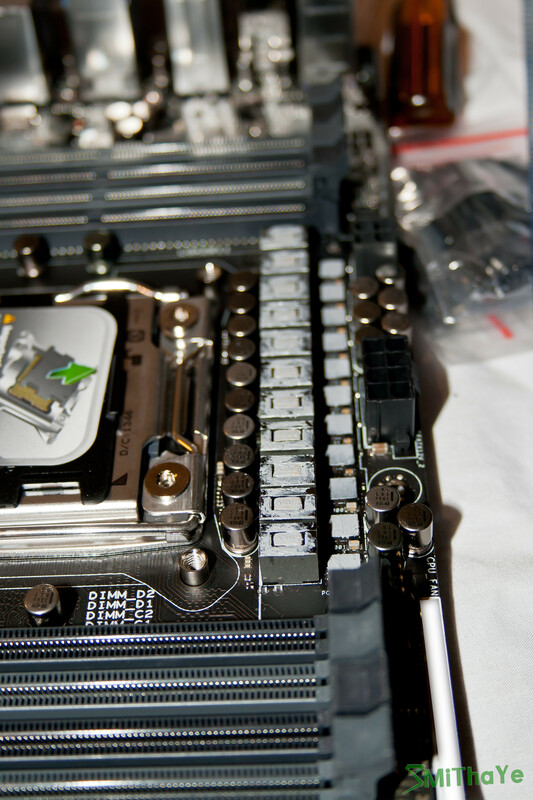 Would have to draining the entire loop via the valve at the bottom to remove any component though. 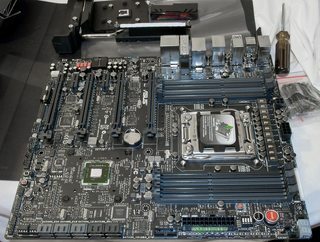 Are you keeping a list with a total cost of this build? That would be interesting to see (if you don't mind of course). Sorry no, not making public what I paid and yes I do keep a list. I'm providing details on all the parts I'm using and you can certainly check the retail price for those components but it's not what I paid and also part of the reason why this build is taking as long as it is. Some of the items weren't in stock too and had lost a lot of time in December waiting for new shipments otherwise it would have been built by the second week of January (in a perfect world). I don't want people to get blinded by the cost of the cost of build and for it to anyway overshadow the final build. Like 'yeah it looks great but you'd expect it to paying that much', etc. 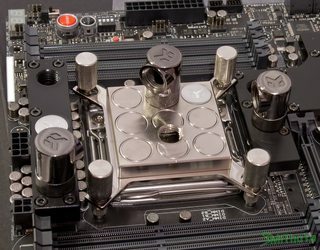 What I spent on Bitspower fittings, adapters, extensions, etc would put off most people from watercooling and found it was the only choice I had in solving height/spacing issues on the planned layout and keeping it clean. Had to change from black nickel to black sparkle for various reasons, I prefer this lighter nickel. While I'm here, quick update to say the two EK CoolStream XT 480 rads ran clear with two 450ml flushes (50c bottled water mixed with 1/2 teaspoon of bicarb), tomorrow I need to do a couple flushes with distilled water to rinse out. Took a while when you have to leave to settle each time but well worth doing and in time awaiting the fittings. 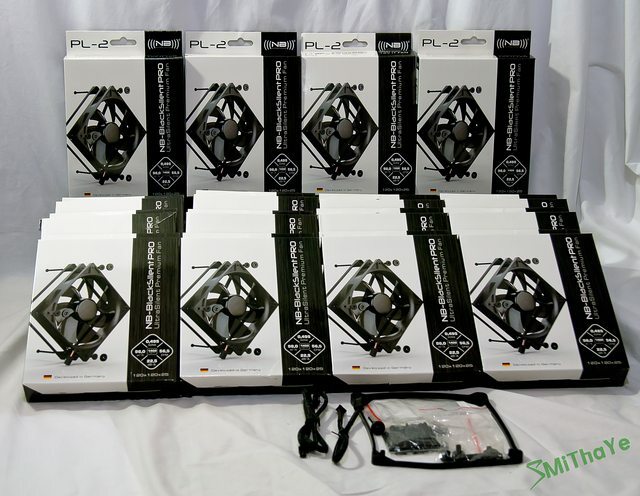 May have fittings Monday or Tuesday but yet again some are out of stock (valve, adapters, extensions), hope to have enough to get most of the loop done otherwise will post progress photos regardless - damn miners lol! 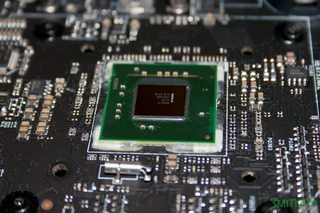 The 780 Ti won't be blocked until I have everything on my desk ready to connect, will only take 30 minutes tops. 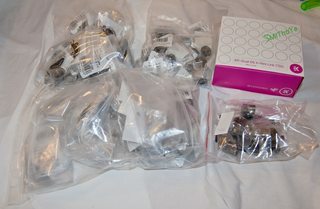 Please don't ask me to type the fittings I got, just lots of Bitspower and XSPC extensions! That's enough for fittings only on the the R4BE/CPU and anything left over will help to redo 2600K loop. The selection of fittings, adaptors, extensions have helped with the difficult lengths/heights, was still a pain getting them tightened. Managed to keep the Bitspower logo facing upwards but blurred it cos it's far too reflective. Using G1/4 extensions for most the blocks has helped avoid damaging the threads due to the amount of times I had to unscrew them. Apart from that long assortment of fittings (the R4BE block out to the GPU,) I used 16 in total and did well considering I don't have most of my 90 degree adaptors and rotaries that I find invaluable. Fittings are the same height as each other to help good flow, they are all true high flow fittings. 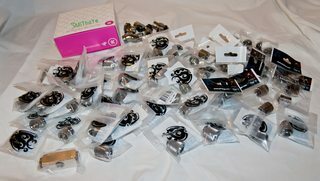 More nervous using fittings this time than mostly tubing because there are a lot of points that can leak despite each fitting/adapter having their own washers. Will have to do a slow syringe fill and use lots of towels. 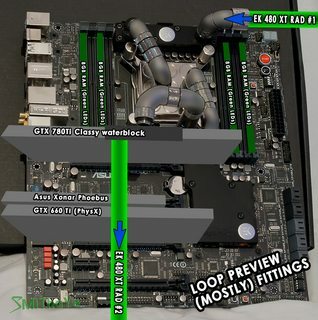 Remember I can't finish this loop until I get that valve for flushing come back in stock. 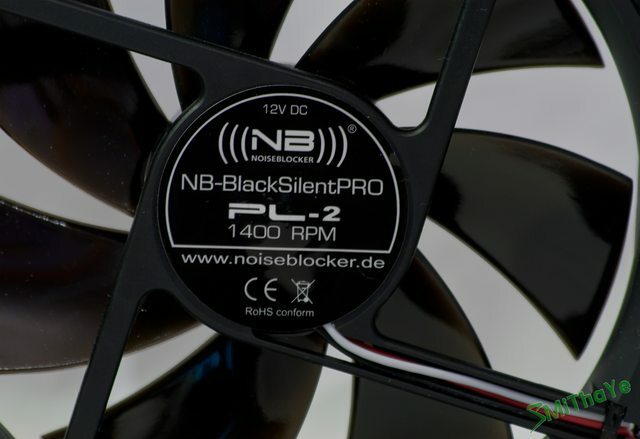 I noticed you're cooling the chipset I have not considered that as you know i'm starting a build very similar to yours, in your opinion is that something I should do ? 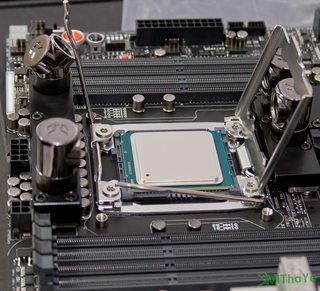 Depends on how much you're going to overclock the CPU, once you get past 4.5GHz the VRMs can reach 80-90°c easily which affects the stability of the overclock. 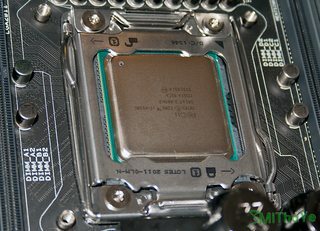 This was my consideration and why I choose the 4930K too because I'm into benchmarking, transcoding, and Folding which requires good temps. 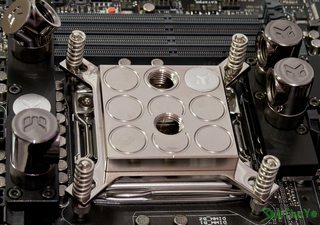 EK block looks great, much better than the XSPC version IMHO and its what most people have bought. So long as you have figured out a neat loop (I found mine a bit tricky due to the height and needing extensions), I'd go for it. 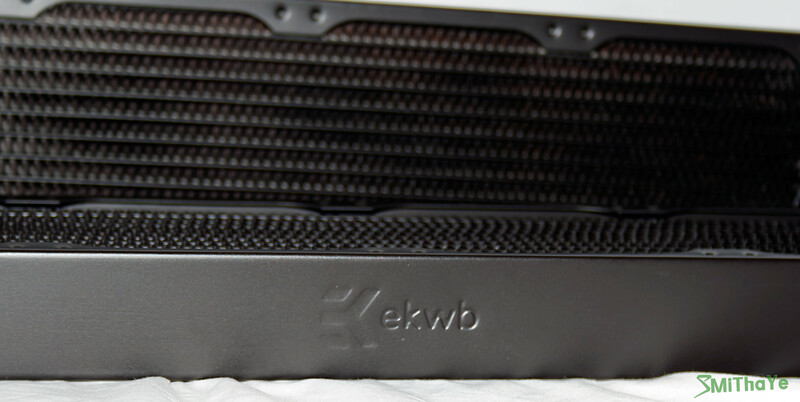 Check your local stores first as they will be cheaper than ordering from EK direct. On backorder are rotaries/adapters and valve. Already flushed the rads and pretty much nothing to it, no video cos I need to keep going. 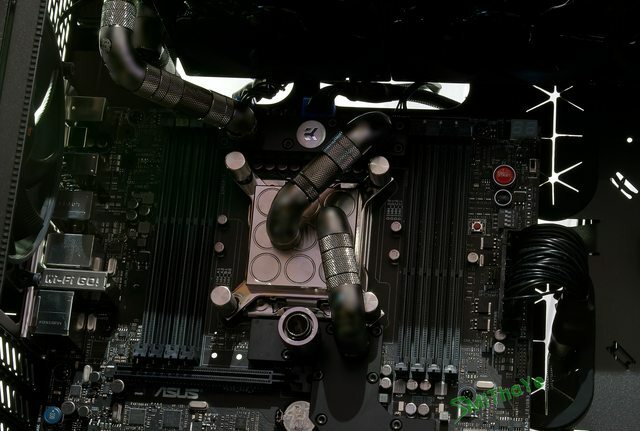 Although I've done a third of the loop and have quite a lot of fittings left, I can't connect the rads until I receive the backorder of 90° adaptors. If you want me to detail what I did read back or I can type it up in steps if required. What you did in your log was what I recommended but just used 5 flushes of 50°c bottled water with 1/2 teaspoon of bicarb and finished with two flushes of distilled. benching lately. We've all read about some people having problems with their R4BE boards like random reboots and the like. So I decided to setup my board and give it a test, No oc what so ever I ran Intelburn test, Realbench, Inter extreme tuning utility, all tests were run 4 times no problems at all. I then set as my oc profile to XMP only ran the same tests all good, I then set my multi to 42, Digi+ LLC to medium, ran all tests again all good no weird problems or reboots. it's just sitting on it box with a 80i for cooler..
Can't seem to upload a pic , it's just sitting on it box with a 80i for cooler..
Good setup and thanks for taking that photo, I have mine on the internal box too as my base for building With my blocks on and all the fitting it must weight at 3-4KGs easily. 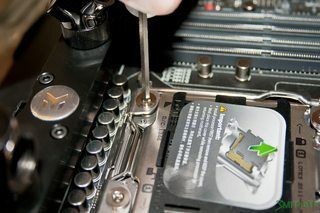 Is that HDD just for testing, and have you thought about getting your PSU cables braided (would look much better because you can still see the coloured wires)? 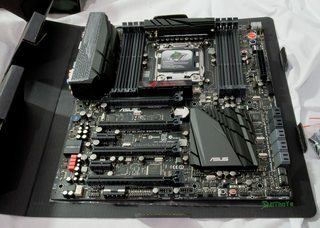 I don't like the R4E 24-pin ATX power being straight. Probably a simple design choice as all the space on the board is occupied. Would have preferred a 90 degree angle to make it easier to cable manage through the rubber grommets but not such a big deal in the 900D as it gives you plenty of routing options. If either of us gets our cables braided it ends up making it easier to flex, depends on the type of sleeving used as some are stretchy. 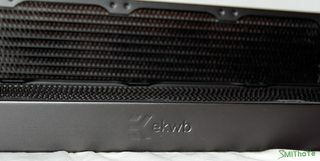 abvolt do we have the same psu ? seasonic 1000w platinum ? 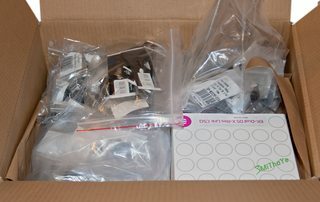 ... BTW i why dont you start a build log , am interested to see your build too ! I have had the best luck with Seasonic PSU's that's all I'll use any more. I am working on my build log today and will hopefully post it today with pics.. Finally got the 900D out its house in preparation for the rads with fixed fans to be mounted and my word is it big. Does look quite a bit wider than my 800D, having measured it the 900D was only 2cms wider (23 vs 25cms). 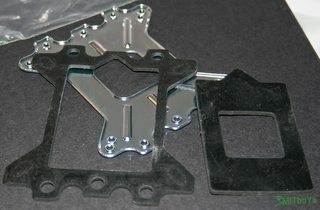 First off to ensure a good airflow I used XSPC 480mm gaskets for each side where only one side is sticky and that side goes on the rad, if you use these you should factor this in for the screws you need to use. I found the four fans each side to cause a possible issue with the cables and used good old insulating tape to keep it fixed even though you'll not see this. Ok, maybe I'm going a bit OTT cable management and possibly not be the best choice aesthetically but it's the simplest. Every couple of fans are grouped to a PWM fan splitter (PWM because 3-pin splitters were three times the price oddly) and this runs alongside the rad and points upwards. I say upwards because this will end up being upside down and the side with the writing on in the photo will be facing away from view. Ended up using the EK 30mm screws for this side. To ensure a secure holding with the small heads for securing this rad and fans to the roof I will use the longer 35mm PL2 fan screws with the metal washer prescrewed, also helps avoid screwing too close to the tubes or puncturing it. I would advise when taking a risk, test with one fan angled off the rad and screw down to check how far it does go and use a ratchet to gauge the turns required for the others, again the ratchet also helps to avoid over or under tighting the screws. Got a busy day today with some travelling to do, like next update will be Thursday. Flushing rad I used a teaspoon of 100% bicarb to lower the pH of bottled water. What I decided on was to put bicarb in empty bottle of water, heat to between 50-53C (shake because the actual temps is higher due to particles interacting), pour via a funnel back into empty bottle, shake for a few seconds and pour into rad via funnel. Took about 20 flushes to clear all the crap out. After the GTs were EOL it was hard to find a good replacement until after months of searching I came across these and performs better than GTs too at half the price. Love the quality of German engineering. 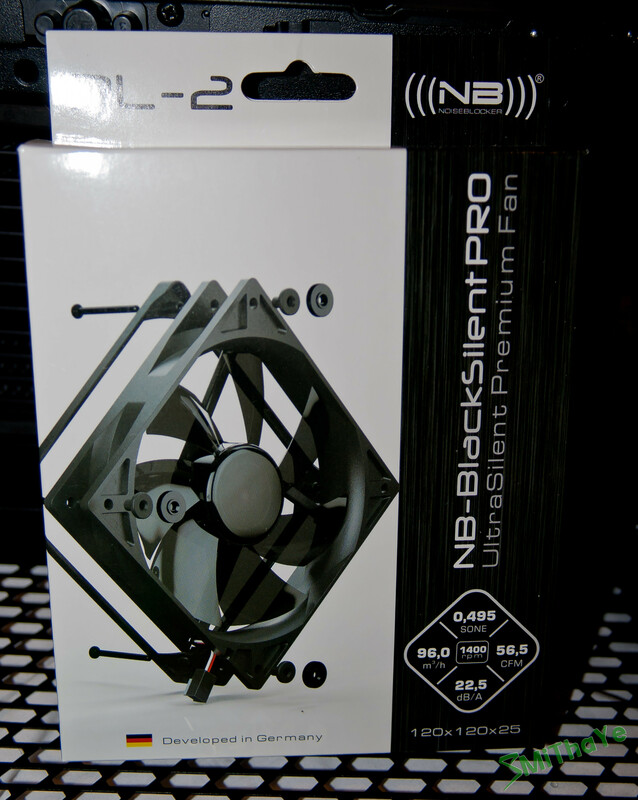 You get a quality glossy fan, rubber gasket for mounting on your case (didn't use it for rads), 35mm screws (too long but got around that so I had 30mm usable), rubber screw sleeves to reduce vibrations and protect surfaces, metal washers, 20cm and 50cm high quality braided fan cable extensions, plus a generous 6 year warranty. This is why you have to be careful not to pull the fan cable, its only secured with small amounts of solder. You could also take the sticker off but the warranty sticker underneath put to bed that idea. yes ! you make the move .. for the amount of bicarb , as a guess , is it close to 20grams per liter or so ? 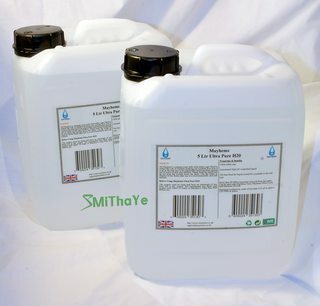 Used 1/2 teaspoon (flat) per 1/4 litre and make sure you shake the mixture well. This is also why you should do a final flush with distilled. On Tuesday I'll have the smaller 250 res coming, 400 is simply too big even in the mighty 900D! Going to relocated the dual pump with X-Res Link to the shelf below the HDD bay and maybe drill holes in the shelf to secure it. 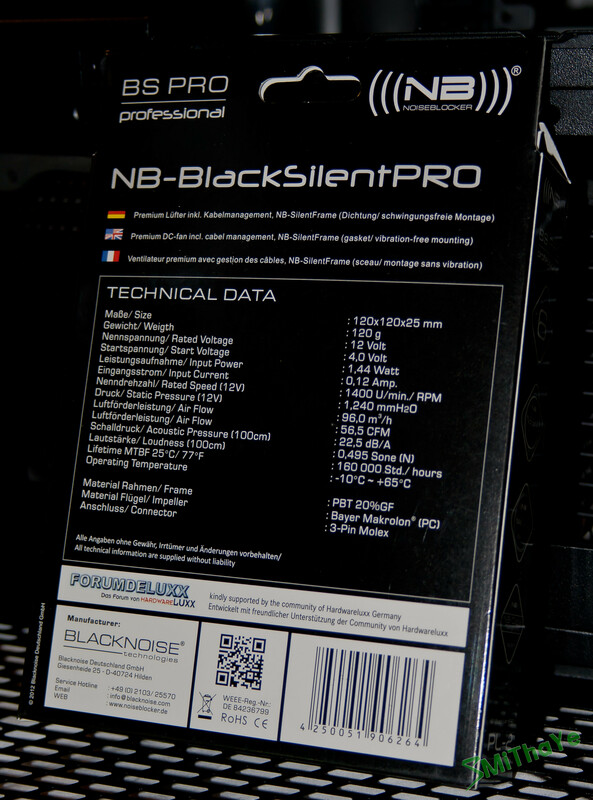 Not really much to do other than fit block to 780 Ti Classified and leak test. 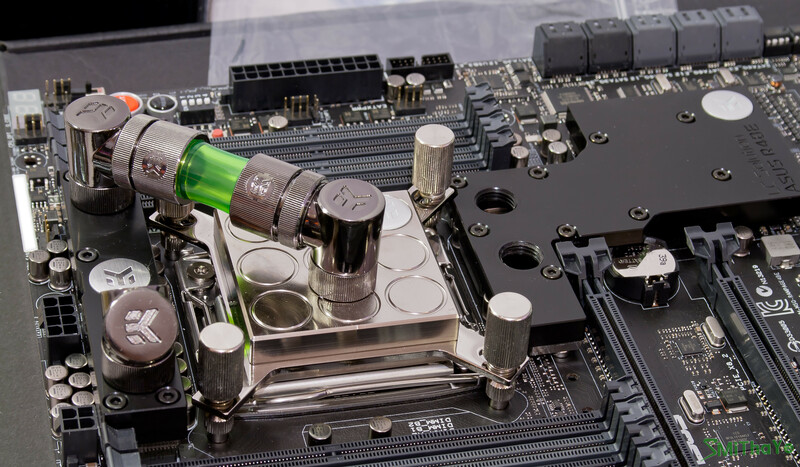 I'm kinda worried about the acrylic blocks on the board the amount of times I've had to change the fittings and will be crossing my fingers everything goes well when the time comes. And yes I will be disconnecting the PSU from the R4BE for flushing in case of leaks. That looks really nice very clean..